For Ettore Bugatti, building cars was simply a matter of seeking perfection or, in other words, a kind of art whichmust be presented in an aesthetic way. The Type 35 startedan era during which Bugatti became the most prominentmake in motor sports for approximately seven years.With the “Nation Colour Project,” we intend to bring thecommemoration of colourful racing scenes of the 20s and30s right to your living room. Rules had it that eachparticipant car of a Grand Prix be decked out in thedesignated colours of its homeland. This model is finished in the official colour pattern of Portugal. fail to do justice to all the colourful race cars of the 1920s and 1930s. Since rules dictated back then that each participating team must have its car(s) donned in a finish of nation-specific colour(s), the starting field typically presented a fantastic, colourful scene. 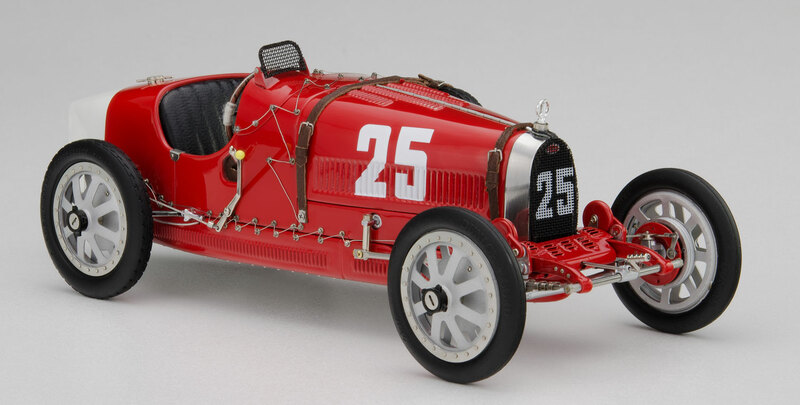 With this in mind, CMC has focused its attention on the Grand Prix model of the Bugatti T35, the most dominant race car of its time, so as to show the diversity of nation-specific racing colours once common on the race tracks. We started the project by featuring the racing colours of Great Britain, Spain, and Poland. Each item is limited to a specific quantity based on the historic achievements and appeal of the car. What you are looking at is a highly-detailed precision replica, where the correct colour pattern is our primary concern. Please be advised that we do not claim that the appearance of our model as well as its decals (e.g. starting numbers) are historically accurate. Nor do we make reference to a specific race or driver with these models. Special feature: Metal body screws are custom-made in the famous Bugatti style. All body screws are positioned faithfully according to the original and secured by a stainless steel wire.